یونسی کردخیلی, حامد, نقدی, رضا, هنربخش رئوف, عباس. (1395). بررسی برخی از ویژگی‌های فیزیکی و مکانیکی چندسازه جدید الیاف پلی پروپیلن/ الیاف چوب/ سیمان. مجله صنایع چوب و کاغذ ایران, 7(2), 207-217. حامد یونسی کردخیلی; رضا نقدی; عباس هنربخش رئوف. "بررسی برخی از ویژگی‌های فیزیکی و مکانیکی چندسازه جدید الیاف پلی پروپیلن/ الیاف چوب/ سیمان". مجله صنایع چوب و کاغذ ایران, 7, 2, 1395, 207-217. یونسی کردخیلی, حامد, نقدی, رضا, هنربخش رئوف, عباس. (1395). 'بررسی برخی از ویژگی‌های فیزیکی و مکانیکی چندسازه جدید الیاف پلی پروپیلن/ الیاف چوب/ سیمان', مجله صنایع چوب و کاغذ ایران, 7(2), pp. 207-217. یونسی کردخیلی, حامد, نقدی, رضا, هنربخش رئوف, عباس. بررسی برخی از ویژگی‌های فیزیکی و مکانیکی چندسازه جدید الیاف پلی پروپیلن/ الیاف چوب/ سیمان. مجله صنایع چوب و کاغذ ایران, 1395; 7(2): 207-217. در این تحقیق ویژگی های فیزیکی و مکانیکی چندسازه جدید الیاف پلی پروپیلن/ الیاف چوب/ سیمان مورد بررسی قرار گرفت. بدین منظور، الیاف پلی پروپیلن در سطوح مختلف 0،2، 3 و 4 درصد وزنی به چندسازه الیاف چوب- سیمان با نسبت وزنی 15 به 85 و در حضور 3% کلرید کلسیم (بر اساس وزن خشک چندسازه) اضافه شده و سپس کلیه ویژگی‌های فیزیکی (جذب آب، واکشیدگی ضخامت بلند مدت) و مکانیکی (مدول الاستیسته، مقاومت خمشی و مقاومت به ضربه) نمونه های ساخته شده مطابق روش های استاندارد ASTMمورد ارزیابی قرار گرفت. بر اساس یافته‌های این تحقیق، استفاده از الیاف پلی پروپیلن تاثیر مثبتی روی ویژگی های فیزیکی و مکانیکی چندسازه‌های چوب- سیمان داشته است بطوریکه افزایش میزان الیاف پلی پروپیلن (از 0 به 4%) میزان جذب آب و واکشیدگی ضخامت نمونه های مورد مطالعه را به طور معنی داری کاهش داد. نتایج آزمون مکانیکی چندسازه‌های مورد مطالعه نیز نشان داد که چندسازه‌های حاوی 4% الیاف پلی پروپیلن بیشترین میزان مقامت خمشی و مقاومت به ضربه را دارا می باشند؛ در حالی که کمترین میزان این مقاومت ها مربوط به سیمان خالص می باشد. همچنین نتایج آزمون خمشی نشان داد که چندسازه‌های چوب- سیمان بدون الیاف پلی پروپیلن بیشترین میزان مدول الاستیسیته را دارا می باشند. Khorrami, M., Amin Khalil Tabas, A. and Nourbakhsh, A., (2009). Increasing the flexural strength capacity of cement composite with natural fibres. Iranian Journal of Wood and Paper Science Research, 24(2):206-218. Banthia, N. and Nandakumar, N., 2003. Crack growth resistance of hybrid fiber reinforced cement composites. Cement and Concrete Composites, 25(1): 3-9. Younesi Kordkheili, H., Etedali, S. and Niatzadeh, G., 2015. Effect of carbon nanotube on physical and mechanical properties of natural ﬁber/glass ﬁber/cement composites. Journal of Forestry Research, 26(1): 247-251. Younesi Kordkheili, H., Farsi, M. and Rezazadeh, Z., 2013. Physical, Mechanical and Morphological Properties of Polymer Composites Manufactured from Carbon nanotubes and Wood Flour. CompositesPart B, 44 (1): 750-755. Younesi Kordkheili, H., Hiziroglu, S. and Farsi, M., 2012. Some of the physical and mechanical properties of cement composites manufactured from carbon nanotubes and bagasse fiber. Materials & Design,33(1): 395-398. Silva, F. d. A., Mobasher, B. and Filho, R. D. T., 2009. Cracking mechanisms in durable sisal fiber reinforced cement composites. Cement and Concrete Composites, 31(10): 721-730. Tarkow, H., 1970. Effect of wood species on the hydration of portland cement. Forest Products Journal, 17(1): 30-32. Govin, A., Peschard, A. and Guyonnet, R., 2006. Modification of cement hydration at early ages by natural and heated wood. Cement and Concrete Composites, 28(1): 12-20. Wei, Y., Zhou, Y. and Tomita, B., 2000. Study of hydration behavior of wood cement-based composite II: effect of chemical additives on the hydration characteristics and strengths of wood-cement composites. Journal of Wood Science ,46(6): 444-45. Al Rim, K., Ledhem, A., Douzane, O., Dheilly, R. M. and Queneudec, M., 1999. Influence of the proportion of wood on the thermal and mechanical performances of clay-cement-wood composites. Cement and Concrete Composites, 21(4): 269-276. Shawia, N.B., Jabber, M.A. and Mamouri, A.F., 2014. Mechanical and physical properties of natural fiber cement board for building partitions. Physical Sciences Research International, 2(3): 49-53. Pehanich, J. L., Blankenhorn, P. R. and Silsbee, M. R., 2004. Wood fiber surface treatment level effects on selected mechanical properties of wood fiber–cement composites. Cement and Concrete Research ,34(1): 59-65. Soroushian, P., Won, J. P., Chowdhury, H. and Nossoni, A., 2003. Development of accelerated processing techniques for cement-bonded wood particleboard. Cement and Concrete Composites, 25(7): 721-727. Jevtić, D. Zakić, D. and Savić, S., 2008. Modeling of properties of fiber reinforced cement composites. Facta universitatis - series: Architecture and Civil Engineering, 6(2): 165-172. Walton, P. L. and Majumdar, A. J., 1975. Cement-based composites with mixtures of different types of fibres. Composites ,6(5): 209-216. Alhozaimy, A. M., Soroushian, P. and Mirza, F., 1996. Mechanical properties of polypropylene fiber reinforced concrete and the effects of pozzolanic materials. Cement and Concrete Composites,18(2): 85-92. Badr, A., Ashour, A. F. and Platten, A. K., 2006. Statistical variations in impact resistance of polypropylene fibre-reinforced concrete. International Journal of Impact Engineering ,32(11): 1907-1920. 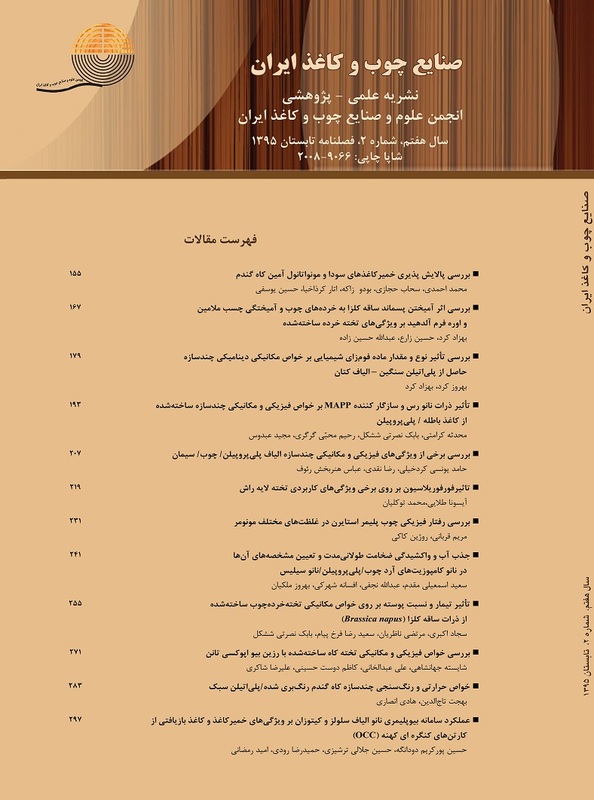 Bagherzadeh, R., Pakravan, H.R., Sadeghi, A.H., Latifi, M. and Merati A.A., 2012. An Investigation on Adding Polypropylene Fibers to Reinforce Lightweight Cement Composites (LWC). Journal of Engineered Fibers and Fabrics, 7(4): 13-21. Tonoli, G.H.D., Savastano, Jr., Santos, S.F., Dias, C.M.R., John, V.M. and Lahr F.A., 2011. Hybrid Reinforcement of Sisal and Polypropylene Fibers in Cement-Based Composites. Journal of Materials in Civil Engineering, 23(2):177-187. Fotsing, J.A.M.and Tchagang, C.W., 2005. Experimental determination of the diffusion coefficients of wood in isothermal conditions. Int J Heat Mass Tran,41: 977–980. Kazemi Najafi, S. and Younesi Kordkheili, H., 2011. Effect of sea water on water absorption and flexural properties of wood-polypropylene composites. European Journal of Wood and Wood Products ,69(4): 553-556. Cai, Z. R. and Robert, J., 2010. Mechanical properties of wood-based composite materials. Wood handbook: wood as an engineering material: chapter 12. Centennial ed. General technical report FPL; GTR-190. Madison, WI : U.S. Dept. of Agriculture, Forest Service, Forest Products Laboratory, p. 12.1-12.12. Xu, G. and Hannant, D. J., 1992. Flexural behaviour of combined polypropylene network and glass fibre reinforced cement. Cement and Concrete Composites ,14(1): 51-61. Santos, A. G. a., Rincón, J. M., Romero, M. and Talero, R., 2005. Characterization of a polypropylene fibered cement composite using ESEM, FESEM and mechanical testing. Construction and Building Materials ,19(5): 396-403. Nili, M. and Afroughsabet, V., 2011. The long-term compressive strength and durability properties of silica fume fiber-reinforced concrete. Materials Science and Engineering, 531:107-111.